Authentic style is not conscious or deliberate. Most of my best work is done when I am in a meditative state, most open to sensations and able to translate them in my work. I am not bound to any specific technique. The subject of my work determines its own best mode of expression. I paint what appeals to me, primarily in oil but do some watercolor as well. I choose scenes and subjects that seem relevant to people’s lives, environs and what’s going on around them, whether it is an open field, an urban intersection, a bowl of peaches or a little girl. I enjoy painting on location, regardless of the season and surroundings. Working from life in this manner is the best way to get the actual colors, edges and true experience of what I am trying to translate to canvas. 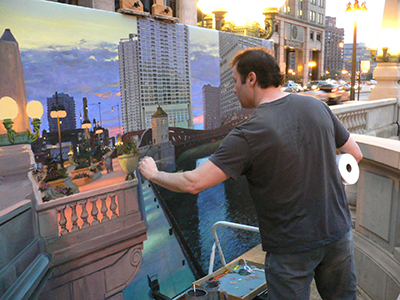 This can be particularly challenging when working on large canvases such as “Twilight on LaSalle Street Bridge”, which required a rented truck to bring the 84”x72” canvas to and from the site and an assistant to ensure it didn’t blow away into traffic, bystanders or the nearby river. Then I return to my studio to refine the work. This process can take months or even years with pieces such as “Sunset at Wells and Wacker” or “Playing Around the Magnolia Tree”. While much of my work is large scale cityscapes and landscapes, I also paint portraits and still-lifes. I enjoy doing commissions because of the collaborative process between me and the client. I took classes at the Art Institute of Chicago when I was 11 years old. I later studied at the American Academy of Art, also in Chicago, before and after getting my B.A. at Washington University in St. Louis. I also studied at the Palette and Chisel Academy in Chicago, The Lyme (CT) Academy of Fine Arts, and the Bougie Studio in Minneapolis. Plus dozens of private commissions for portraits, landscapes, cityscapes, and still-life works over the years.